While I have come nowhere near to one hour a day for seven days, I have at least pushed myself to the front of the queue and sewn something for myself this Selfish Sewing Week. 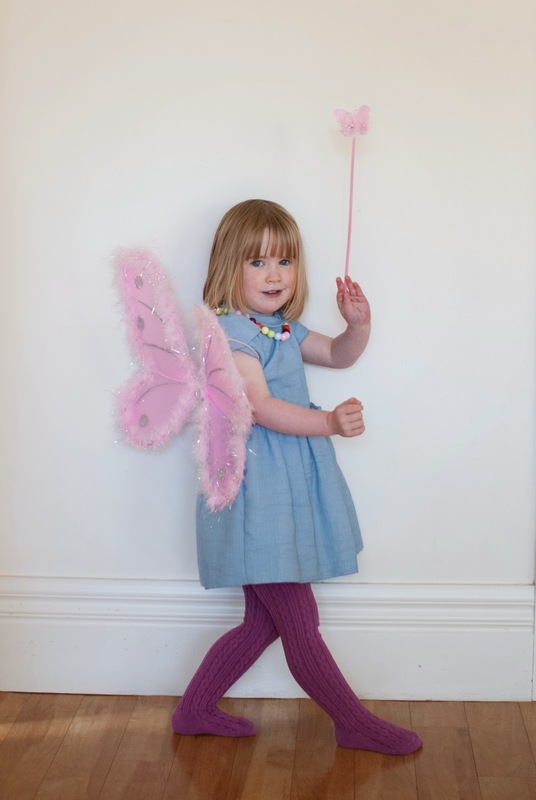 But before we can have any pictures of me, the lighting-test-subject-fairy had to wave her wand in approval. 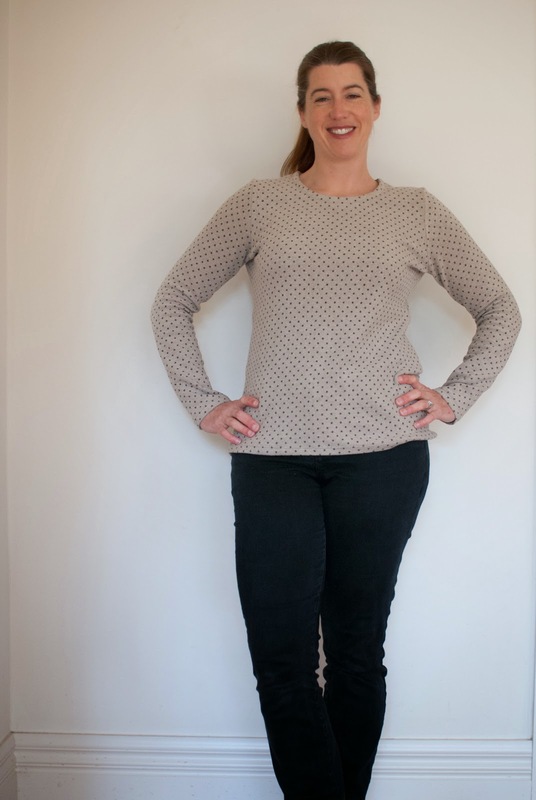 The top is the Liesl & Co Metro T. This time I went down a size to a straight L, as I was making something that was more for winter weather, and this thicker knit could afford to be a bit closer to me. Actually I would like to wrap myself in about five layers of this stuff and hibernate throughout winter like some larva in a cocoon! It is sooooo soft and lovely. Here's the change up I did make. 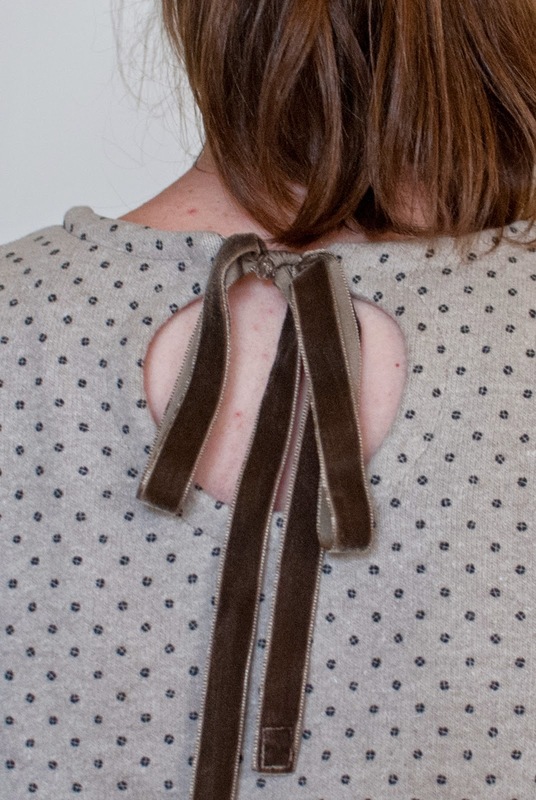 Instead of a neckband, I cut a front and back facing and then made a keyhole opening in the back. 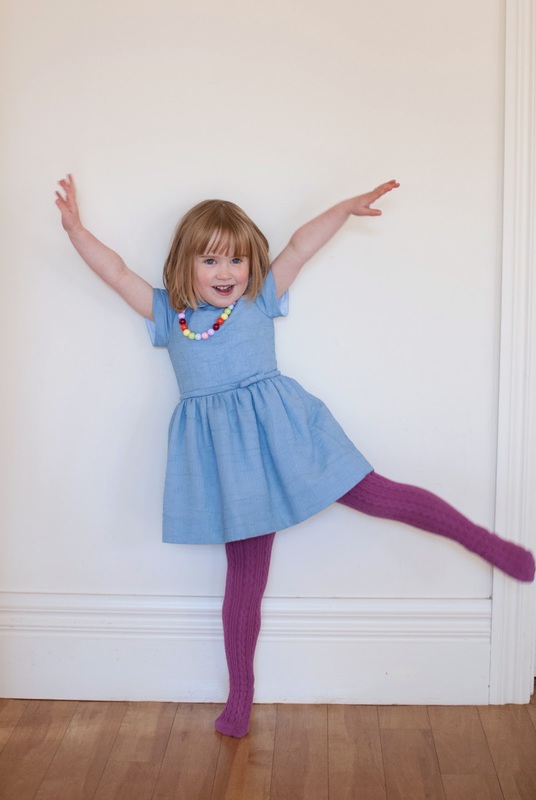 The inspiration was from this top I spied on Kollabora which in turn was a copy of a Petit Bateau top. I adore that one but I have such a surplus of navy/white striped tops but no taupe and spotty ones, until now! The ribbon was a gift from Mamzelle Fourmi along with my order. I LOVE it when a fabric shop does that. There were two little bags of fabric swatches, this ribbon and some purple cord that co-ordinates with the pockets on my Coco. I hadn't initially planned to use this fabric for the top idea, but when the right ribbon was already there, it seemed like it was destined to be. I probably could have made my opening more cup shaped and less of a complete circle, but I like it after all, and the good news is there's still enough stretch in the neckhole that I don't have to untie it to put it on or take it off. I tried tying a neat bow upside down behind my neck and no surprise, I'm not very good at it! It took me a while to get around to making this, so Selfish Sewing Week was just the motivation I needed. Of course, now it's spring, and I'll probably have to put it away for a few months. I imagine that I may have to pat it every once in a while, until autumn comes around and I can wear it again. Nope, apparently not with me in the way! Now that's a well-fitting top. No need to hold hands with the kids! I like the way you did the back opening, and wow that facing is so incredibly neatly finished. Thanks Marisa. I love my overlocker. I think that's been the biggest motivation for sewing for myself, that I can make it look a bit less homemade on the insides! The fit is perfect alright! Just the right length of sleeve and that fabric is lovely! Thanks Katy. It feels so nice and I'm very glad I took a chance on going down a size. Hoping the cooler weather sticks around for you, it looks fabulous. Love the key hole mod. I feel a bit selfish wishing for more cold weather! Thanks for the compliments. This is lovely - love the back. Thanks Justine. The kids were so delighted to be allowed to press the button, I felt bad that we must be a bit camera precious the rest of the time. 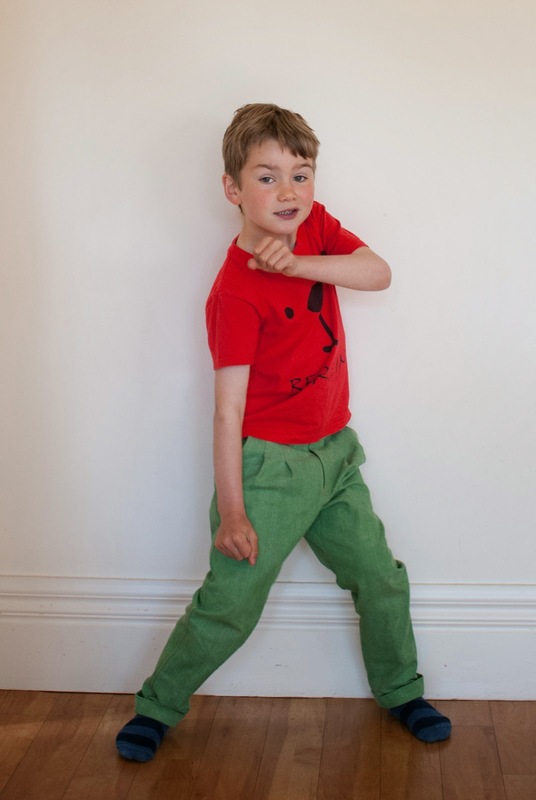 I'm amazed how my son can dance when no-one's looking! I adore the keyhole opening in the back! Any chance of you doing a step by step tutorial? Thanks Cindy. I did think for a moment about doing it as I went but I always feel it's that kind of arrogance that is destined to make a project fail! You see, I'm always slightly surprised when I get something right. 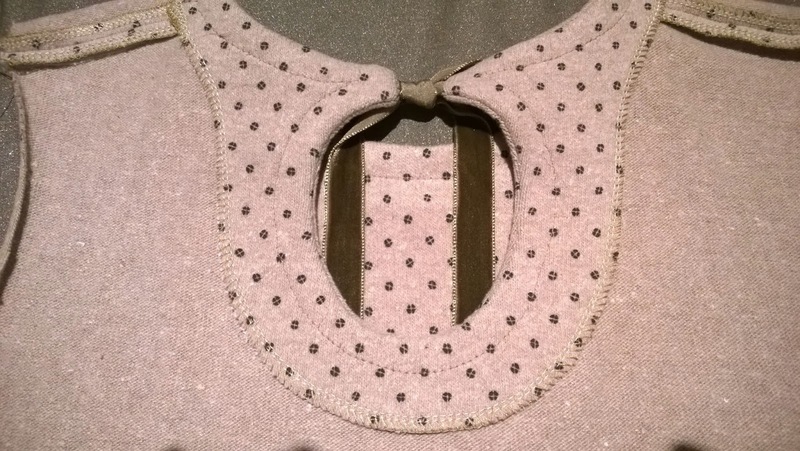 I'll have to see if A wants a mini version in which case I'll definitely take pics of the neckband to facing alteration. I hate taking pictures of myself so I feel your pain! The shirt is a great fit and keyhole opening is super cute! I've been itching to make some t-shirts for myself but I first I need to find some knits that I like and that's not always so easy. It's weird isn't it? I've become very aware of how many chins I have! Thanks for the compliments. I'm delighted with this T-shirt and for cooler weather this fabric is the best thing ever. I expect buying knits online is much more troublesome than other kinds of fabric, nothing beats a feel, a stretch and a drape in a real bricks and mortar shop. Thanks Esme. I hope you'll be as pleased with the pattern as I am. I often make a first version in a cheap and not so impressive fabric but then what to do with all the B grade versions that end up in the wardrobe?... Good luck and happy sewing. What a great top! That keyhole/ribbon combo really elevates this to a new level, and your work, as I can attest to firsthand, looks so impeccable. That photo of the inside has me weak at the knees:) Beautiful job, Shelley - I would wear this to death if it were in my closet! Thanks Lucinda. You're just the sweetest. It took me a while to work out how to serge around curves neatly, but my overlocker and I are really getting along famously these days!